WordSmith is a memoir by Bristol writer A C H Smith of something that was never easy but which must seem almost impossibly difficult to an aspiring young writer today. How to spend one's life exclusively as a writer and yet manage to pay the gas bills. From fiction, theatre, television, screenplays, poetry, novelising and journalism he has pieced together a literary living for more than half a century, with only an occasional excursion into well-paid academic life. He was part of a glittering arts scene in 1960s Bristol, with playwrights Tom Stoppard, Peter Nichols and Charles Wood, film-maker John Boorman and artist Derek Balmer among the brightest luminaries. Smith recruited Stoppard to write for the remarkable Western Daily Press arts page which he, Smith, edited for several years before it was killed off by a philistine editor. Ghostwriting for Wolf Mankowitz, rewriting chunks of Shakespeare for the stage and hosting a long-running TV arts programme... it has been an immensely varied career. Smith recounts the pinball pattern of freelance life which has included working with Boorman, Richard Hoggart and Stuart Hall, Peter Brook and Ted Hughes, and Jim Henson, the creator of The Muppets . Along the way, there have been meetings with Hemingway, Beckett, John Berger and Allen Ginsberg. Among Smith's Bristol achievements, the play Up the Feeder, Down the Mouth , a moving and amusing story of the decline of the city docks, is outstanding. Interesting insights into the ups and downs of literary life are provided by his correspondence with four friends who started out at the same time – Janet Burroway, Zulfikar Ghose, B S Johnson and Tom Stoppard. The first two have depended on teaching posts to underpin their writing careers, B S Johnson remained defiantly independent but ended his own life in 1973, while Stoppard struggled until in Rosencrantz and Guildenstern are Dead he achieved the perfect solution: worldwide and lasting success. The unpaid intern at the Independent last week probably didn't mean any harm, but his/her 'highlights' of Bristol's Festival of Ideas comprised a list of familiar London names. As anyone knows who's sick of Stephen Fry, celebrity is a warm room with few key-holders. The rest of us can press our faces to the window, or get on with our lives. The real star of the Festival of Ideas, ACH Smith (a Londoner whose Bristol roots run deep) has a vast body of work: novels, novelisations, screenplays, plays and poetry. He has written about cricket for The Times , rewritten Shakespeare (and is suitably modest about it) and his Edward and Mrs Simpson was given away with peanuts. Having read WordSmith (obsessively) I could list the people Smith's worked with, the writers he's met, the cricketers with whom he's shared a crease but taking names out of context would turn him into a name-dropper - and he's much more than that. 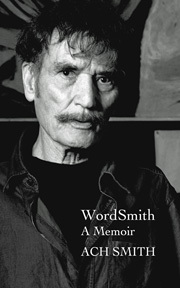 WordSmith is a memoir, not an autobiography and perhaps the difference lies where Smith allows himself to stand aside and let other protagonists take centre stage. From his schoolboy awakening to words (Eliot's 'scuttling across the floors of silent seas') to disenchantment with current Bristol theatre, he writes fervently about the craft of writing and the tenous, strange and occasionally glamorous life of writers. Glamorous? In Smith's telling it's a life not so very different to our own, with gas bills to pay, no money and the smell of babies. The early loss of his mother (and thus his father too) is rendered so perfectly close to my own experience I was grateful for reading it. As a boy of the Attlee generation from the Middlesex suburbs (a house with a number not a name), Smith was educated at Cambridge in the sexless '50s, a time of CND, Craven A and cricket, cold war and duffle coats and authentic, artistic endeavour. His visiting card read 'Anthony Smith, poet', he edited the arts page of Varsity , contributed to Granta and delta and after graduation stacked crates of Guinness at the Putney brewery where his father worked. He revived the University Poetry anthology, worked for the Kentish Mercury and in Pamplona ran with the bulls and met Hemingway. Moving to Bristol he teamed up, against his better judgement, with a loose-limbed and loutish Tom Stoppard at the Western Daily Press (where the Arts Page doubled Monday circulation - and was once produced entirely in French). There, with fine timing, they caught the cultural surge of the 60s. Download a short excerpt from the memoir here. To order a copy, contact www.redcliffepress.co.uk.